Tim’s Kitchen offers an immense range of Cantonese dishes, be it homestyle favourites or banquet showstoppers, in a convenient Kowloon location. Conveniently located within a restaurant row in Elements mall, Tim’s Kitchen provides a casual setting for groups large and small. A small number of intimate banquette seats are available, and while they are screened off from other diners, it is open to a public passage, albeit a quiet one. Window-side seats offer views of the container ports and the harbour, as well at the traffic leading into the Western Harbour Tunnel. Tables are spaced at a reasonable distance apart so you won’t be forced to eavesdrop on your neighbours (or vice versa). We start with a siu mei platter of honey-glazed barbecued pork and crispy baby pork belly. The barbecued pork comes in large slices, and while the meat is tender, it seems waterlogged and the flavour of the meat is lost. The crispy pork belly is much more impressive, with incredibly brittle and crunchy skin, and fine, alternate layers of lean meat and fat. The deep-fried diced tofu with peppercorn salt has a batter that is so perfectly crisp it almost shatters, providing the perfect contrast to the silky tofu within. 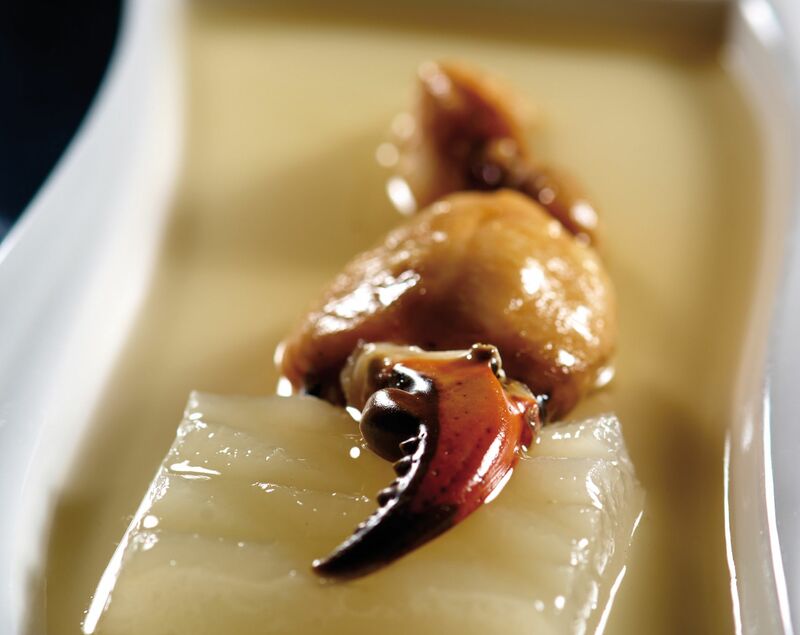 The braised pomelo skin with shrimp roe is thick but lacks flavour. More stock and gravy cooked into the skin would have made it much more enjoyable. Sweet and sour pork with pineapple is practically a staple at every Cantonese restaurant, so it’s disappointing to find that the batter on the pork was much too clumpy and had absorbed the moisture from the sauce much too quickly, making it rather soggy. For dessert, the translucent ruby cubes of the steamed red jujube cake are a delight, with a delicate balance of sweetness and tartness. Given jujube’s frequent appearance in Chinese medicine, eating these feels almost virtuous. There is a short, single-page wine list that isn’t particularly inspiring, with a few wines by the glass under $100 each from value labels. Prices on the list escalate quickly, with the most expensive being a 2000 Bodegas Vega Sicilia “Unico” at $3800 for the bottle. There are no premium teas or other special beverage offerings. Service is generally friendly and swift, as one would expect of a well-oiled machine that is a long-running Chinese restaurant. Servers are happy to suggest suitable dishes, which is particularly important at a restaurant that runs many seasonal specials. Dinner for two with tea charges comes in under $800, which is quite standard, although we’d happily pay a little more for better attention to detail, especially in some of the essential Cantonese dishes.